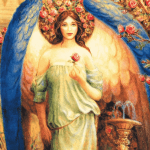 I am Jophiel and I am the one who is spreading joy and your true self is strengthened by my presence. I come to those who dare to stand up for themselves or wish to do so. The more true and sincere people who speak the language of their heart the more joy can be experienced on Earth. The misunderstandings become fewer and people obtain a greater understanding for each other and the experiences they share but still feel and interpret in different ways depending on one’s own experiences. You receive a broader picture and greater understanding for each other’s differences and you discover that the core is still the same. It is the experiences and your ability to share your experiences that set you apart. You even have different abilities, which makes you see things from different perspectives. Imagine the multitude and the joy it can be to share all of this with each other. It is now a time for you to come together and share your experiences. However, this requires that you are true to each other and yourselves. A true and honest person does not judge any other true and honest person. They give thanks for the confidence and move on with a larger trust and belief in themselves and the humanity they belong to. They feel at the bottom of their soul that they have many more experiences than what they now can remember or understand. They are humble in their comportment and know and understand that we all are dependent on each other and that a helping hand is worth more than a chance word. It is joy that you now will spread over the Earth – the joy over yourselves and each other. It is the joy to once again be able to walk on the path of the roses, where the thorns have turned inwards in order not to hurt your feet. It is love, friendliness and helpfulness that are important now. You are all each other’s equals on one way or another so greet each other humbly and with love as it is through your love that you ascend together – your love to yourselves and the world around you. Let laughter and joy carry you forward now. Let the bells ring in your ears, which tell you that it now is joy that will rein on Earth. It is the joy to exist, the joy to be true, humble and an honest person. It is the joy to be able to sing, dance, paint, write and so on. It is the joy to be oneself and to feel God’s touch in your heart. Laughter, joy and harmony have returned to Earth. Take hold of these vibrations and let them vibrate within you as much as you can and are able to. You can all feel this vibration in your quite moments of harmony and peace. Bubbles of joy emerge within you and around you. It leads to much laughter and joy. This is when you feel in harmony and are joyful. This vibration you also carry with you when you are occupied with something that gives you strong motivation or is close to your heart. If you want more joy in your life call on me and I will wake up your heart’s longing and joy. It is when you follow your heart that you can find your passion in life. It is a passion that makes your life exactly as alive that you wish it to be. With these words I leave you now and wish for our next connection soon.